After Days Of Silence, Court Says Detained Iranian-American Is Testifying Marizeh Hashemi, a TV anchor in Iran, was arrested Sunday in the U.S. and is testifying before a grand jury in Washington. This is the first time U.S. authorities have commented on her case. 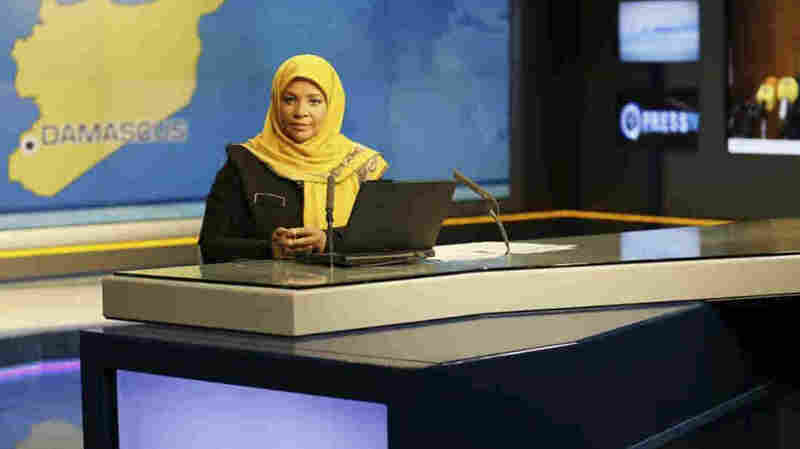 American-born news anchor Marzieh Hashemi sits in a studio in Tehran where she works for Iran's state television. She was arrested Sunday during a visit to the U.S., her family says. She is testifying behind closed doors to a grand jury in Washington, D.C., in an unspecified case, a U.S. judge said Friday. Family members say Hashemi, 59, was detained at St. Louis' Lambert International Airport on Sunday and then taken by the FBI to Washington. But the FBI and other law enforcement bodies refused to comment, declining to say whether she was even in their custody. Judge Howell said Hashemi has not been charged with any crime, but has made two appearances in District Court. She is expected to be released when she completes her grand jury testimony. Howell's order did not say when Hashemi might wrap up her testimony and gave no information on the case in which she was testifying. However, Hashemi's lawyer, Preston Burton, said, "we expect that she will soon return to her family, her home, and her career." Hashemi was born in New Orleans with the name Melanie Franklin. She married an Iranian man, converted to Islam, changed her name and moved to Iran in the 1980s. While she's unknown in the U.S., she's a prominent figure in Iran due to her position on state television. She's a citizen of both the U.S. and Iran. "The custody of Iran's reporter in the U.S. is highly political and she should be released immediately," Iran's Foreign Minister Mohammad Javad Zarif was quoted as saying by the Islamic Republic News Agency. Hashemi came to the U.S. to visit relatives and to shoot a documentary, according to The Associated Press, which spoke to her son Hossein Hashemi. "We want more clear answers," Hossein Hashemi said in a separate interview with Press TV. "We have hard time understanding how someone who is not charged can be held in a facility like that." Federal law allows for the detention of a person who is "material in a criminal proceeding" if it seems that person is unlikely to respond to a subpoena. In a 2009 interview with NPR's Scott Simon, Marzieh Hashemi defended Iran's then-President Mahmoud Ahmedinejad and his expulsion of foreign media after a violent crackdown on protesters who challenged his election victory. "I think the average Iranian feels very free to express themselves, OK?" Hashemi said. "But I think that within the framework of the laws in this country — and each country has its own rules, and its own laws. So freedom of expression, I think that through time, there's certain times, especially in emergency situations, difficult situations that governments all around the world are going to make certain decisions."